Louth Indoor Bowls Club’s ladies team enjoyed an aggregate shots victory in their county match at home to Scunthorpe. But they only just managed it after the visitors had gone in front with just a couple of ends to play. Going into the last hour Louth held a slender lead, but this was soon eroded and Scunthorpe went ahead by four shots. The outcome was only decided on the final end of each of the last two rinks to finish. Sylvia Stainton’s rink scored four shots for a 24-18 win, and Bernice Culham trailed the jack into the ditch for one shot to give her rink a 19-14 win and secure an overall victory of 91 shots to 87. The best winning rink for Louth, however, was that of Chris Love, Mary Cave, Sue Gurbutt and Mary Barker which won 21-10. The other two rinks were won by the visitors. * The men’s over 60s team lost their match 102-74 at home to Lincoln who had already clinched the county title. Louth did salvage two points with Rob Lamb’s rink winning 22-14. * Louth men’s B team had a closer contest at home against Sleaford, but the visitors won on three rinks and just edged the aggregate by 101 shots to 96. Louth’s best rink comprised of Pete Stainton, Dave Stringer, Jeff Baker and John Readman which won 30-8, while the four of Alan Watson, Brian Smith, Peter Hill and Barry Jordan won 25-20. 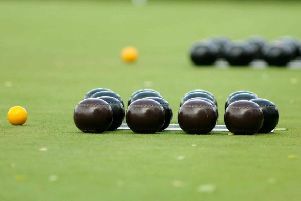 * Two club members came close to winning a trophy while on a bowls holiday break with Potters Resort in Cyprus. Janice Hexton and Yvonne Cooper joined up with two other people to reach the final of the competition where they were narrowly beaten. Their endeavours did win them a four-night break at a Potters Resort. * The club’s knockout finals are being played this weekend followed by the presentation of trophies on Sunday evening.